A "terms and conditions" hire agreement, suitable for B2B as well as B2C deals. Use to hire out wide variety of products including audio-visual or any other technical equipment. A thorough and complete contract to protect the owner in every way. 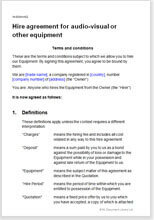 These are the business terms and conditions for hiring out the audio visual equipment or any technical as well as semi technical products to businesses or consumers.This agreement is drawn as a “terms and conditions” document which you will probably send out with a quotation or place on your counter, ready for a customer to sign. Use this template for a business model where the hirer signs in your shop or on delivery by you to his site. You can also adapt it for use on your website. Use for any hire period. hire out any product to consumers. Our use of plain English makes this document easy to edit to match your business model, without having to be your own advocate. This is not a hire purchase agreement and does not provide any sale option. The owner of the product remains the exclusive sole owner of the product. Using a professionally drawn document will give you the confidence to know that your valuable goods have the best possible legal protection. Terms and conditions are probably the best example of a legal document where use of plain English strengthens the legal effect of the document. If a dispute should arise, it would be hard for a hirer to claim that he did not understand, even if English is not his first language. provide alternatives for collection of equipment and make solving disputes easier.